While other competing teams played their matches over the course of 3 days, Lionotics 2 played all 9 of their matches back-to-back on Sunday, leaving no time to strategize or make required improvements and repairs to their robot. Lionotics 2 was created this year to make room for students who wanted to join MTA’s robotics team, Lionotics, which was already full. 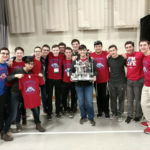 Despite this being the team’s inaugural year, they surpassed the pre-existing MTA team in the FIRST Tech Challenge and won the NYC Championship to qualify for this event.